Our Shaggy Bear with Advertising T-Shirt from Calendar Lady Promotions is an excellent promotional item which will help you to keep your business promoted at all times. This 12 inch bear will come with a T-Shirt printed up with your business details and company logo to ensure that you stay advertised at all times. So promote your business details upon our Shaggy Bear with Advertising T-Shirt today! Call 01989 565281 and our friendly staff will be happy to give you a FREE quote! To find out more about our Shaggy Bear with Advertising T-Shirt click here and fill in the contact form and we'll get straight back to you. 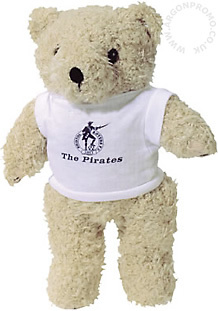 Other promotional and personalised items besides our Shaggy Bear with Advertising T-Shirt click here.